For the last three weeks, a young prince has taken up residence at the Garden Theater. He’s searching for meaning and purpose, and it seems he’s found it in the Short North Arts District’s northern end. 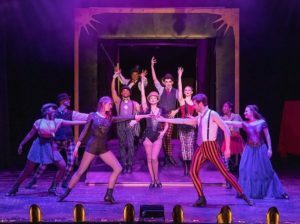 We’re speaking, of course, not of an actual prince, but of the eponymous character in Short North Stage‘s current production, Pippin, which began a four-week run on March 21. Critical notices from The Dispatch, Columbus Underground, and Broadway World all agree: the intentional casting and thoughtful choreography make for an exceedingly entertaining show. We chatted with actors Corbin Payne, Amber Knicole, Thom Warren, and director-choreographer Edward Carignan about the experience. 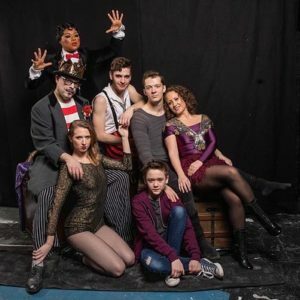 Since 2011, the Short North Stage theater troupe has worked to make the Garden Theater a vibrant destination in the District by re-envisioning classic works of American theater, Pippin included. While Short North Stage founders Peter Yockel and Rick Gore got the ball rolling and continue to be integral in its success, New Hampshire native Carignan took up the reigns as the company’s first Artistic Director in 2015. Carignan already had 15 years of experience performing, directing, and choreographing in New York City, and had guest-directed three shows for Short North Stage. 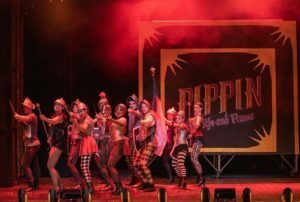 For the 2018-2019 season, Pippin was included because it’s Carignan’s favorite show and the company “felt like we had something to say about it,” he said. To cast the title role, Short North Stage held auditions in New York City, seeing over 300 actors until landing on Colorado native Payne. “There’s something about Pippin that’s sort of mysterious, and he has a specific energy. Not every very talented tenor can do it,” Carignan said. “We just really loved what Corbin brought to the table; there was something interesting about him.” Payne, who was in the process of moving to NYC full time in the fall of 2018, decided to audition after seeing the show lineup in Short North Stage’s 2018-2019 season. “I’ve always wanted to mess around with Pippin and play with that character. It’s an iconic piece of theater,” he said. For the roles of King Charlemagne and his mother, Berthe, Carignan wanted one actor to play both, an untraditional choice. He cast Warren, and with 30 years of professional acting experience, 15 of them spent with the international Broadway tour of The Lion King, to say the New Jersey native is a veteran is an understatement. “It’s been wonderful to be able to play very different energies in the show and very different dynamics between the characters,” he said. “What I love in this dark show is the ability to find the comedy in the sort of buffoonery of the king and the emotional heart of his grandmother.” Warren knew playing the role of “a man in a dress for laughs” would be the easy and maybe more obvious option, but said he felt it was important not to in order to maintain the relationship between Berthe and Pippin. Knicole was cast as Leading Player, her second role with Short North Stage following her turn as Effie White in the 2017 production of Dreamgirls (also directed by Carignan). She was critically praised for her performance, which was no small feat since it had been a decade since she’d last performed in a musical. Though she had done musical theater in high school and at Capital University, after graduating she quickly jumped into beloved local neo-funk band MojoFlo. While on the festival circuit a few years ago, Knicole was introduced to various “circus arts” including hula hooping and aerial silks, which she then incorporated into the band’s shows and which made her Carignan’s first pick for Leading Player. “As a performer, I’ve always wanted to do everything – to sing, and dance, and act, and whatever else I can get my hands on,” she said, noting that acting is a particular passion. “I like who I’m able to be onstage; I like being able to transform.” Though this was the first character with which she could not readily identify because of the dark, manipulative personality, she enjoyed stepping outside her comfort zone and exploring the role. Knicole is matter-of-fact about her work ethic – “I want to bring it every time; I’m very serious about what I do” – and it is not unnoticed by her co-stars, nor is her talent. “She’s a force to be reckoned with, in the best way,” said Payne. “She’s a hard worker, and she brings passion with her every day.” The feeling is mutual; “I want to be as good as I feel like everybody else is,” she said. Carignan and Warren, both relatively new transplants to the city, each found something special during visits that eventually drew them back permanently. “I did three shows [with Short North Stage] and found myself going back to NYC and missing Columbus,” Carignan said, noting that he is “thrilled” the community has been so trusting and welcoming of the company’s vision. Warren first visited the city during The Lion King tour and decided to make the move after receiving an offer to be an Associate Professor of Theater at Otterbein University. “Short North Stage have such a clear vision for what they want this theater to be and to serve in this community. It’s been such a gift to be part of that,” he said. 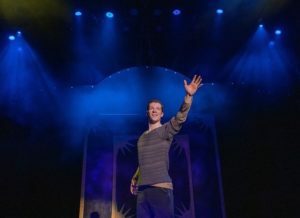 Pippin recently extended to April 21; details about showtimes and tickets are available at shortnorthstage.org.